Propane exchange prices are higher! 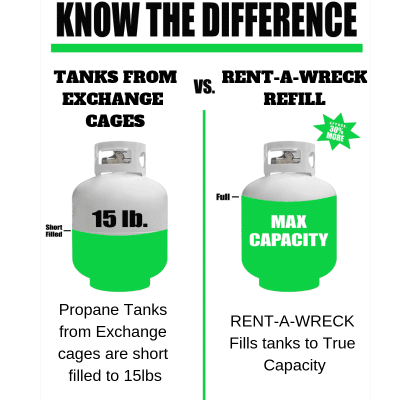 Propane exchange costs more and you only get 15 lbs in your tank. We fill your gas grill tank to the full 20 lbs of propane for which your tank was designed. You do NOT get a full 20 lbs when you take it to an exchange center. In a propane tank exchange, they only put 15 lbs. in your tank (5 lbs. LESS than the capacity of the tank!) Since this is not widely known, it often seems better to exchange...but it is always a better use of your money (and time) to have your tank filled at Rent-A-Wreck. Need a spare tank? We have those too! 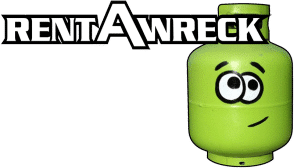 You can also recycle your unwanted/out of date propane tanks at Rent-A-Wreck at no cost to you. We know that propane tanks can be heavy, and we are happy to assist you in unloading and loading your tank for you. Propane sales for grill tanks, fork truck tanks, and tanks up to 100 lbs.